Good news for all dog owners of Chihuahuas and Terriers out there! Clifton Park has designated an area in the Mary Jane Row Dog Park for smaller breeds in order to create a more peaceful environment. Town board members came up with the idea when time after time again they felt nervous having their small dogs play with the larger dogs - which can be an ugly situation. The area for small dogs, which measures 50 ft. by 70 ft., will isolate the small dogs and will hopefully reduce the issues between dogs when their owners take them to the park. It will also encourage owners to take their dogs out more, as a lot of people feel they have to wait to use the park until the larger dogs are gone. 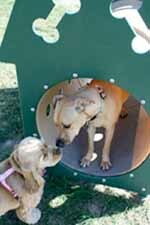 This small dog park is also a great idea for puppies to socialize with dogs their own size. The Town Board was getting many complaints from park-goers, so they approved the plan to develop the park. Improvements have been made gradually over time so hopefully these improvements will be another step to creating a better situation for all who uses the park - especially the dogs!